← Can Boat Tail Bullets Shoot Good at Close Range? A fellow hunter wrote an email and asked a good question, what cartridge should he use on Sambar deer? Actually, his question had a little more depth than that as I found out. 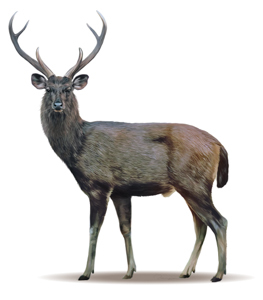 Sambar deer are a hearty animal that weren’t indigenous to the area but introduced into Victoria, Australia in 1860. They have flourished ever since and from what I’ve read about them, they will eat a wide variety of plants including the endangered species that authorities don’t want disturbed. They usually have three points on each antler and get to a size that can be compared to mule deer up to elk size. This would indicate that a medium diameter bullet from at least a medium velocity cartridge is going to be a good choice. Regardless of that, he let me know they have a cartridge restriction on their deer hunting. The restriction is a minimum bullet diameter of .277” with a minimum bullet weight of 130 grains from a case with a minimum length of 51mm (2.007”) for hunting them. Even though it is a fairly common sense rule, I still get hung up on the fact that they had to put it into law. This led him to mention that he lives in what he calls ‘the golden triangle’ and that there are a lot of poachers that will shoot deer at night in populated areas endangering the lives of other people. One example he gave was a large stag shot in a suburban train station car park with a 444 using soft loads so, needless to say, they have a problem over there. Without a doubt, this gets the local authorities itchy to pull over everyone and anyone caught having a firearm together with anything that emits light will be arrested. He wanted to keep above the minimum guidelines just to make sure he could prove that he has the right equipment if he is ever approached while hunting. He also wanted a cartridge that wouldn’t beat him up with every shot like his big gun does (by the way, the big gun is a 338-378 Weatherby. Ouch!). I mentioned several cartridges that could work well for him, even some more obscure wildcats that should be easy to make if he has a good gunsmith to work with on the firearm. So after careful thought and a lot of emails back and forth he chose the 270WSM. It just barely fell into place above the restriction limit but it should work well for his species of deer and other types of animals if he chooses. It will give a faster velocity because of its wider body compared to other cartridges of the same length and there are plenty of appropriate bullets for this work level. Another selling point was that it is a factory made cartridge in a factory chambered firearm so factory brass and reload data should be easy to find. This is one of those hunts I may never get to go on in my mortal life, but I can always dream about it till that someday comes. And when I do, I’ll take a light weight hunting rig chambered in this cartridge… maybe a Winchester Featherweight? Update: With the availability of components and the finding of a good action that needed little to no modifications other than a new barrel, he chose a different cartridge than the 270WSM. In fact, he decided on a wildcat cartridge he called a 308/270. By the way, he lists it just the opposite of the way we do here in the states, we would list it as 270/308Win so he is necking down a 308 Winchester case to use .277” bullets with no other changes. This combination should give him the ability to push a 130 gr bullet to 3,000 fps or so at the muzzle of a 24” barrel. That puts it right on the heels of the 270 Winchester but using less powder to do it. Hopefully, he will keep in contact with me and updated on his successful hunts with it. This entry was posted in Hunting Stories, Reloading and tagged 270 WSM, deer hunting, elk hunting, hunting in Australia, hunting sambar deer, sambar deer, Weatherby, Winchester. Bookmark the permalink.